Peanut butter was invented and reinvented many times during history. Peanuts were known as early as 950 B.C. and originated in South America. The ancient Incas used peanuts and were known to have made it into a paste-like substance. As a crop peanuts emigrated from South America to Africa by early explorers and then traveled by trade into Spain who then traded the product to the American colonies. The first commercial peanut crop was grown in Virginia in the early to mid 1840's and in North Carolina beginning around 1818. According to the Corn Products Company, Dr. Ambrose Straub of St. Louis patented a peanut butter-making machine in 1903 and some unknown doctor invented peanut butter in 1890. Dr. John Harvey Kellogg patented a "Process of Preparing Nut Meal" in 1895 and used peanuts. Kellogg served the patients at his Battle Creek Sanitarium peanut butter. Joseph Lambert worked for Dr. Kellogg and began selling his own hand-operated peanut butter grinder in 1896. Almeeta Lambert published the first nut cookbook, "The Complete Guide to Nut Cookery" in 1899. By 1914, many companies were making peanut butter. Joseph L. Rosenfield invented a churning process that made smooth peanut butter smooth. In 1928, Rosenfield licensed his invention to the Pond Company, the makers of Peter Pan peanut butter. In 1932, Rosenfield began making his own brand of peanut butter called Skippy which included a crunchy style peanut butter. Agricultural chemist, George Washington Carver discovered three hundred uses for peanuts and hundreds more uses for soybeans, pecans and sweet potatoes. He start popularizing uses for peanut products including peanut butter, paper, ink, and oils beginning in 1880. The most famous of Carver's research took place after he arrived in Tuskeegee in 1896. However, Carver did not patent peanut butter as he believed food products were all gifts from God. The 1880 date precedes all the above inventors except of course for the Incas, who were first. It was Carver who made peanuts a significant crop in the American South in the early 1900's. After all peanut butter is just roasted peanuts crushed into a paste. One-half of all edible peanuts produced in the United States are used to make peanut butter and peanut spreads. Copyright 2012 Christine's Pantry, All rights reserved. In a large bowl, add cake mix, peanut butter, water, vegetable oil and eggs. Beat with hand held electric mixer on low, for 30 seconds, then medium speed for 2 minutes, scraping bowl occassionally. Preheat oven to 350 degrees. Place paper baking cups in muffin tins. Divide batter evenly among muffin cups, about 2/3 full. Bake about 18 to 20 minutes, until toothpick inserted in center comes out clean. Remove from muffin tin to cooling rack. Cool for 30 minutes. Frost with nutella. Garnish with chopped peanuts. Enjoy! The other half is used by that peanut company to make cocktail peanuts and dry roasted that my dad loves to eat! Thank you for this information! My mouth is watering at the thought of this combo. That cupcake really looks yummy ! I love the nutella frosting ! Lovely looking cupcakes Christine I bet they are delicious. Have a wonderful weekend. That looks so delicious and am sure it is too with nutella frosting! Hey Christine, Looks great and your post was fantastic, very informative! PB and chocolate cupcakes will always get my attention - YUM! Lipsmacking cupcakes with nutella frosting. It's so rich n moist. This looks so good!! and the nutella frosting, it can only be delicious!! Oh my - that sounds very good! Yum! What can I say, I eat peanut butter by the spoonful straight from the jar, I have to make these cupcakes! Peanut butter, nutella...that's a killer combination! Your blog posts are always informational and delicious too! Thank you, Brianna! Happy birthday to your husband. One of these days I really need to incorportate Nutella into something. It's my hub's fav. You put everything I love into one cupcake! YUM! This is a great combo for a cupcake. I would love to eat that right now. Chocolate and PB are the best! 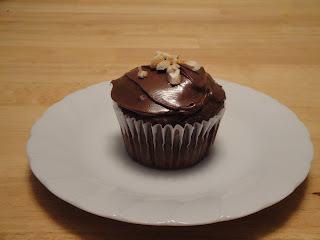 I just made a chocolate cupcake with a pb filling! I love your use of nutella.. another winner in my book! Thanks for sharing an interesting piece of history. The cupcakes look sinfully delicious!! Those are lovely and easy--I would struggle not to eat the Nutella frosting right out of the bowl! I do love me some peanut butter and nutella! I love this cupcake, it looks so delicious and rich :) Beautiful job! Love anything with Nutella! Great recipe! Nutella frosting really takes these over the top! Love it. These cupcakes are perfection, Christine! Love the nutella frosting! i love the nutella frosting. great idea! I am sure glad someone invented peanut butter. And combining it with chocolate is even better. These cupcakes look amazing.